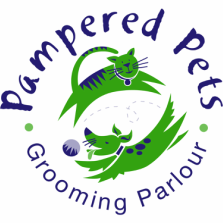 At Pampered Pets in addition to bathing and brushing our groomers Gift & Lesley are skilled at grooming different styles and breed specific cuts. Below is an overview of our grooming services. *Prices differ depending on size of dog & coat length. At Pampered Pets we have a collection & delivery service for your convenience for a small additional surcharge. Click here for more information. At Pampered Pets we groom cats too! If your cat is not used to being groomed please inquire about lightly sedating your kitty. *Prices differ according to coat length.